Author(s) Bank, Andrew; Bank, Leslie J. 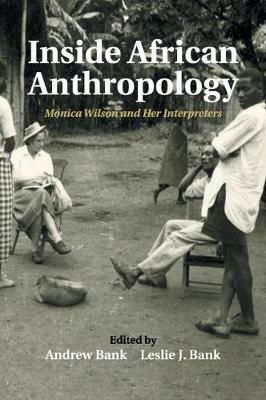 Inside African Anthropology offers an incisive biography of the life and work of South Africa's foremost social anthropologist, Monica Hunter Wilson. By exploring her main fieldwork and intellectual projects in southern Africa between the 1920s and 1960s, the book offers insights into her personal and intellectual life. Beginning with her origins in the remote Eastern Cape, the authors follow Wilson to the University of Cambridge and back into the field among the Mpondo of South Africa, where her studies resulted in her 1936 book Reaction to Conquest. Her fieldwork focus then shifted to Tanzania, where she teamed up with her husband, Godfrey Wilson. In the 1960s, Wilson embarked on a new urban ethnography with a young South African anthropologist, Archie Mafeje, one of the many black scholars she trained. This study also provides a meticulously researched exploration of the indispensable contributions of African research assistants to the production of this famous woman scholar's cultural knowledge about mid-twentieth-century Africa.